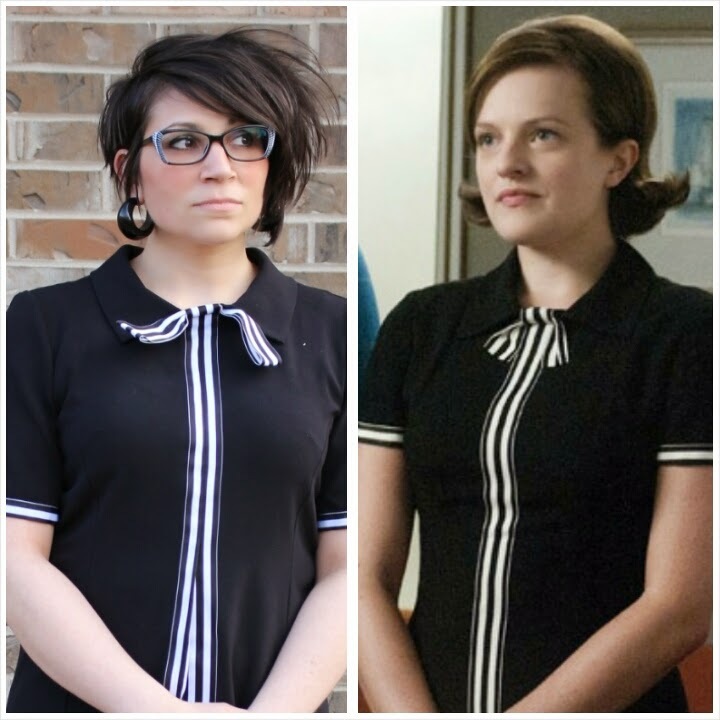 Mad Men Dress Challenge 3: inspiration for this dress came from the character Peggy in an office ready LBD with stripe ribbon detail. The dress was worn in Season 5, Episode 1. 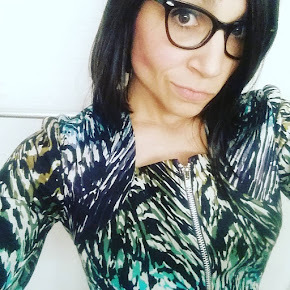 My dress fabric is a solid black stretch gabardine. My trim is a 1 1/2" stripe grosgrain ribbon. I slightly adapted the design, I made my neckline bow larger than the inspiration. I also elected to let the bow free hang opposed to stitching stationary to the dress. I lengthened the sleeves to my personal comfort length for arm coverage. My dress is a looser A-line shape from the year 1969. I fused two vintage patterns from the Mad Men era. Simplicity 8341 for the body of my dress and Simplicity 7750 for my neckline, collar and sleeves. Simplicity 8341 is one of my all time favorite patterns the back and side front are one piece with a fish-eye dart from under the arm to the hip for shaping. Pattern fitting adjustments: broad back adjustment, distributed shoulder dart, shortened torso. Simplicity 8341 has a center front seam design that becomes a pleat at the waistline. 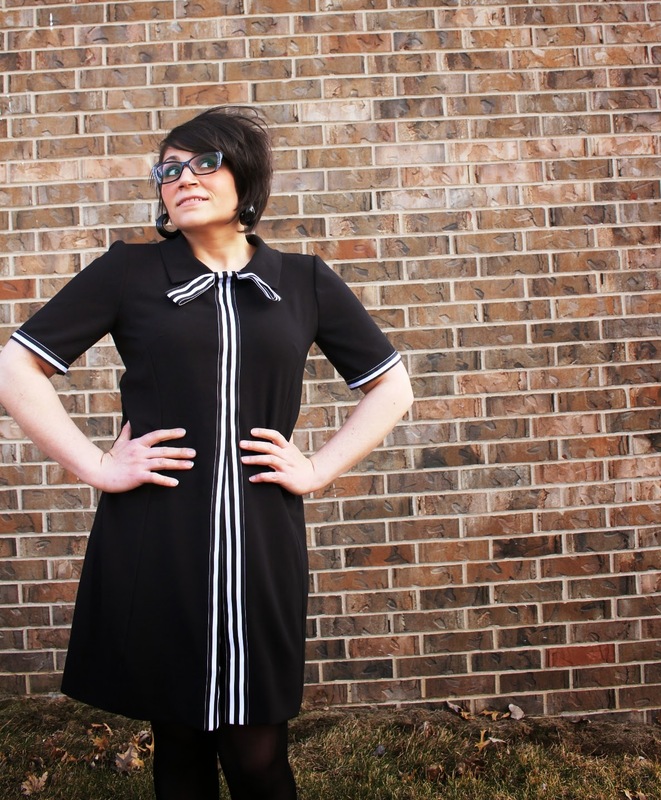 In order to achieve the both the ribbon front detail of the Mad Men inspiration dress as well as maintain the pleat design feature of the vintage pattern, I used a length of ribbon on each side of the front pieces centered along the pleat line. One ribbon folds over the pleat and the other remains flat against the dress. Above the waistline each half of the ribbons meet at the stitching line of the center front seam to form the look of one fluid ribbon, then at the pleat the ribbons split to open the pleat for wearing ease. The pic on left shows the dress inside you can see how the ribbon meets on the seam allowance then continues to the skirt pleat. Additional length of ribbon was added at the neckline that wrapped over the bow between the collar then i anchored the collar and bow with a neckline facing to clean finish the neckline. The sleeves were finished with the ribbon as well, the ribbon merely folded over the raw edge of the sleeve like a simple binding. At my back neckline tacked down my back collar points. My closure is a center back invisible zip. 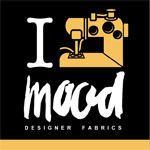 Thank you to the lovely Julia Bobbin for hosting another fabulous Mad Men Challenge! I love it! This has always been a contender for me in this challenge but it got pipped this year as I did a Peggy dress last year. Looks just like the inspiration! Quite a few Peggy looks are my favs. She verges into the young mod cusp but a timeless wearable level of 1960's fashion. I love your dress! Really attractive and fits you very well. So cute! I love this! Especially the back pointed collar and the front pleat! Plus I think it totally fits your style. Great job! Thanks Carrie, I am a 1960's mod girl at heart! Oh this is such a great dress, I just love it! wow, this dress is so cute. I've admired Peggy's dress for a while, yours is such an amazing copy. LOVE IT! This is gorgeous dress! I love everything about it. Well done! It's perfect! I loved this 60's Mod-Style dress on Peggy, your version is brilliant. Love your version - the pleat front is lovely!